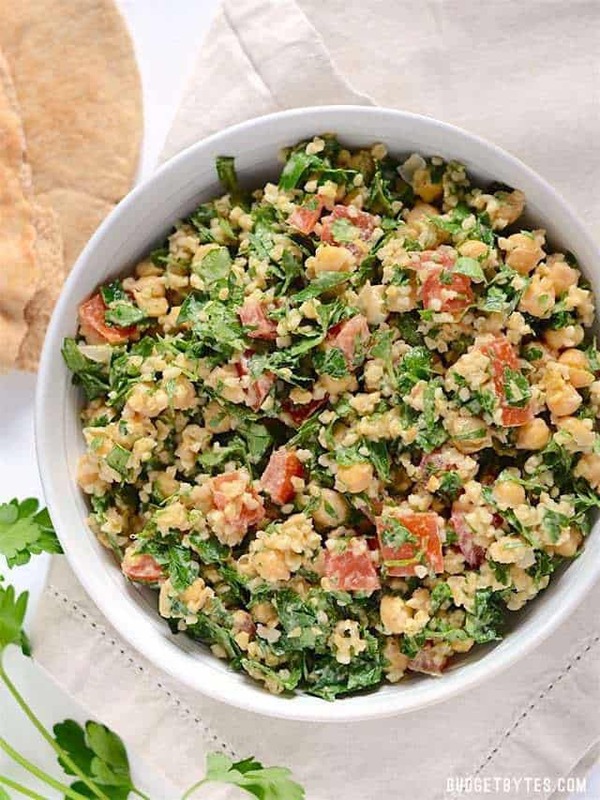 You may be looking at that picture and thinking, “But where is the falafel?” Well, it’s not a salad with falafel, it’s a salad made out of falafel ingredients. Falafel Salad, get it? You see, I was really craving my falafel the other day, but I was too lazy to make the little patties or fry them. So, I wondered what all of the ingredients would taste like just thrown together in a bowl. Pretty damn good, that’s how it tastes. I had to do a little tweaking, but all in all this Falafel Salad is super amazing. 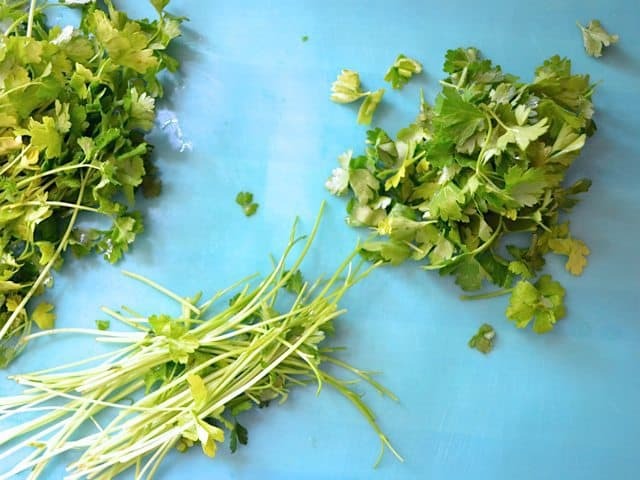 Instead of regular salad greens, it starts with a a bed of fresh parsley and cilantro. Those two herbs are what make the falafel taste so amazing and fresh. 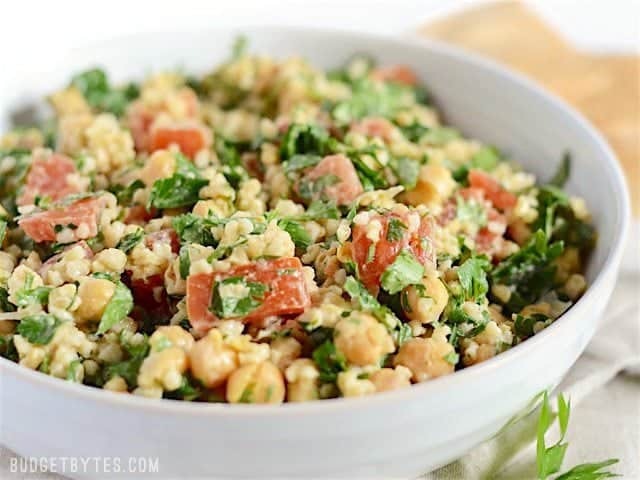 Chickpeas add body to the salad and bulgur wheat gives extra texture. Fresh tomatoes went into the mix to make it a little more salad-like, and I would have added diced cucumber if the selection at the store hadn’t looked so pitiful (wrinkly cucumbers are so sad). I had to find a way to get all of the falafel spices into the salad, so I mixed them right into a basic tahini lemon dressing (because you’d probably drizzle some tahini over the falafel anyway, right?). The tahini dressing was so zingy with its fresh garlic that I skipped the red onion that is in the original falafel recipe. It wasn’t missed. The end result was so amazing that I didn’t have time to notice the onion’s absence. 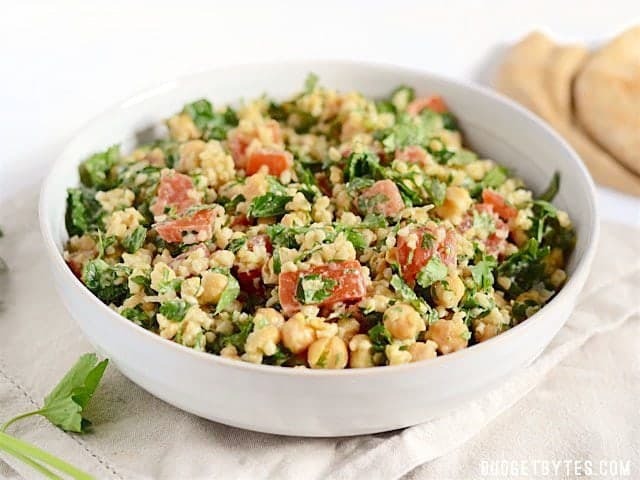 I’m totally IN LOVE with this Falafel Salad and can see myself making it at least once a week, if not only as an excuse to eat this amazing dressing. 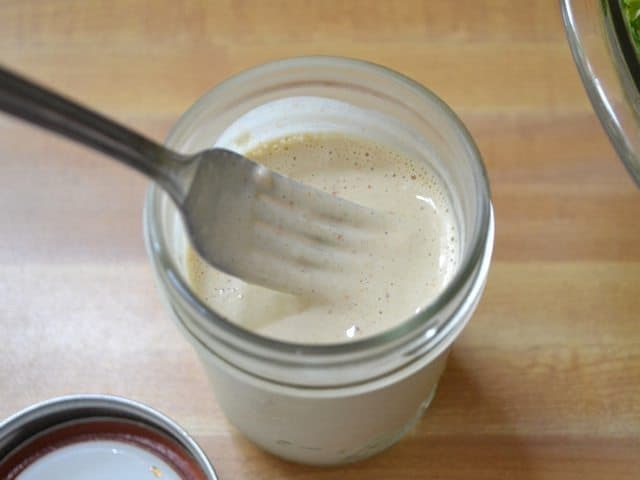 I’m pretty sure I’m going to have a jar of the tahini dressing in my fridge at all times. NOTE: If you can’t find bulgur, you can use couscous, or even quinoa as a gluten free option. This falafel salad is packed with fresh vegetables, drenched with a tangy tahini dressing, and is 100% vegan. 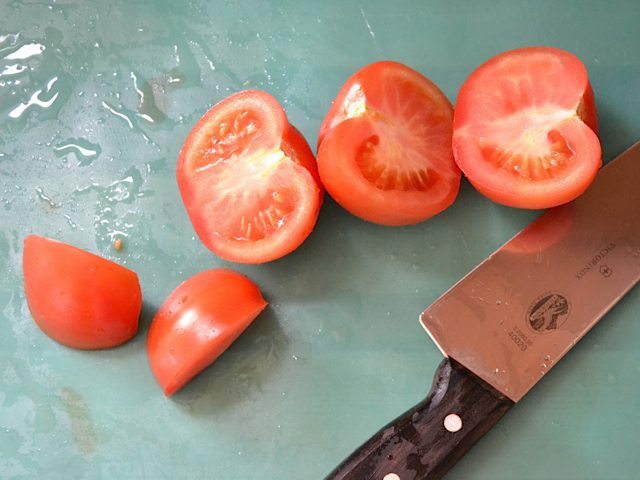 To make the dressing, smash the garlic cloves under the blade of a knife or roughly chop them. 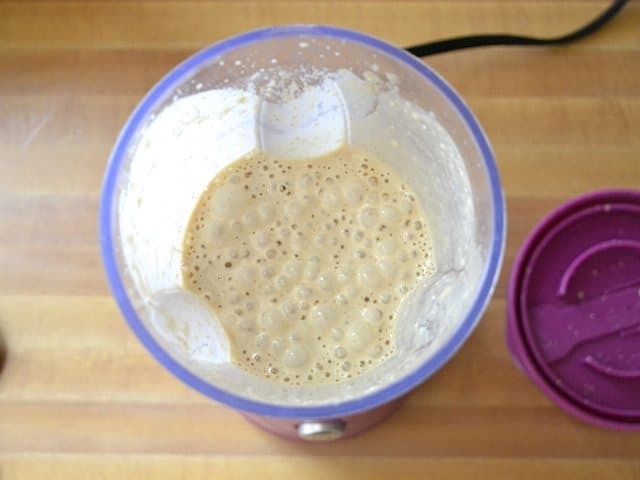 Add the garlic, tahini, water, lemon juice, cumin, cayenne, and salt to a blender. Blend until the mixture is smooth and the garlic is in small pieces. Refrigerate the dressing until ready to use. 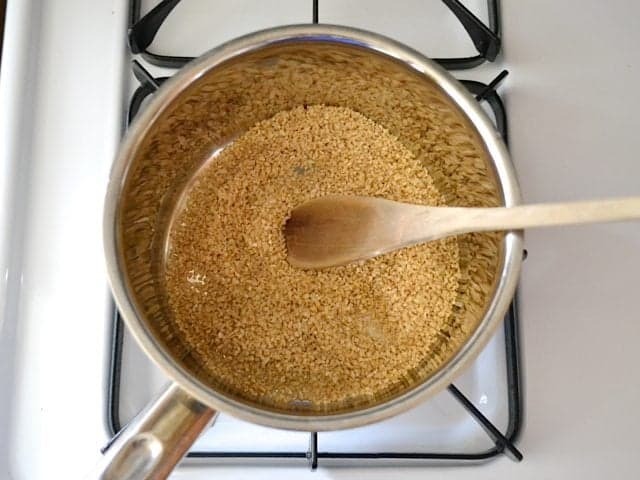 To cook the bulgur, place the dry bulgur in a sauce pot. 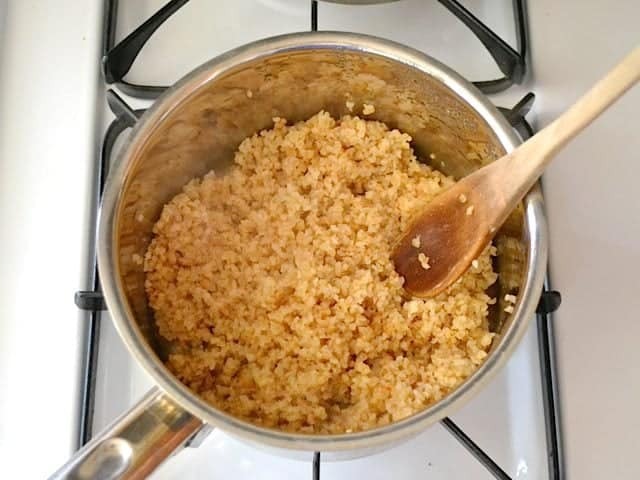 Cook and stir the dry bulgur (without water or oil) over medium heat for two minutes to toast it slightly. Add one cup of water and bring the mixture up to a boil. Add a lid to the pot, turn the heat down to low, and let it simmer for 20 minutes. 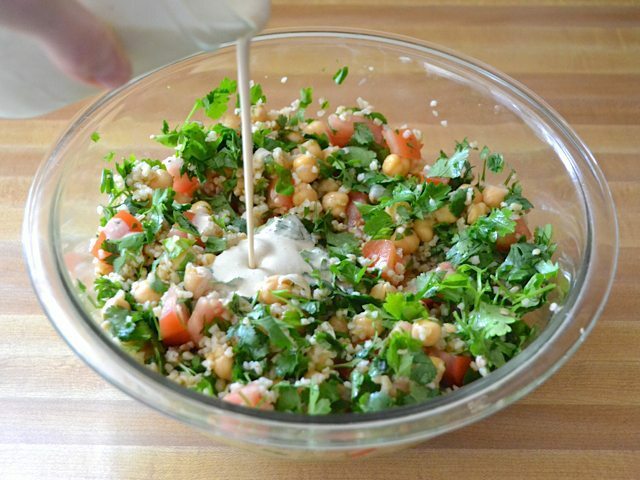 After 20 minutes, fluff the bulgur and transfer it to the refrigerator without a lid to cool. Wash the parsley and cilantro well under cool water. Shake as much water off as possible. Pull the leaves from the stems and then roughly chop the leaves. 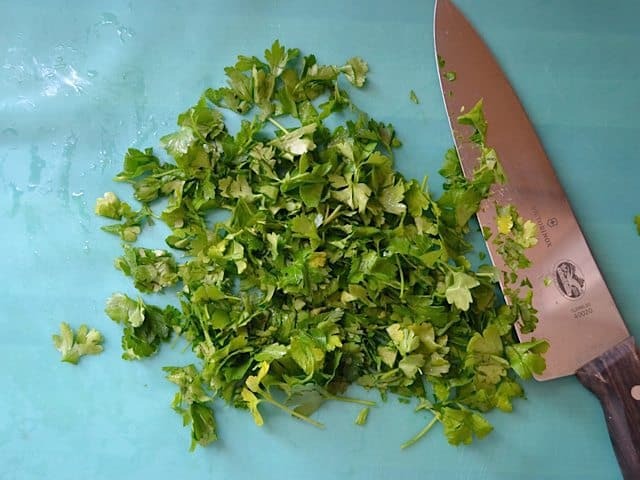 Place the chopped parsley and cilantro in a bowl. Dice the tomato and add it to the bowl. Rinse and drain the chickpeas, then add them to the bowl. Finally, add the cooled bulgur to the boil and stir to combine the ingredients. Add a liberal amount of the tahini dressing and stir until everything is well coated. Want to add more? Diced cucumbers or crumbled feta would also be amazing in this. Make the tahini dressing first, so that the flavors have a few minutes to blend while you’re making the rest of the salad. Smash or roughly chop two cloves of garlic, then add them to a blender with 1/3 cup tahini, 1/3 cup water, 1/4 cup lemon juice, 1/2 tsp cumin, 1/4 tsp cayenne pepper, and 1/2 tsp salt. Blend the ingredients until smooth and no large chunks of garlic remain. Refrigerate the dressing until ready to use. Next, it’s time to cook the bulgur. Again, if you can’t find bulgur (I got mine from the bulk bins at the grocery), you can use couscous or quinoa. 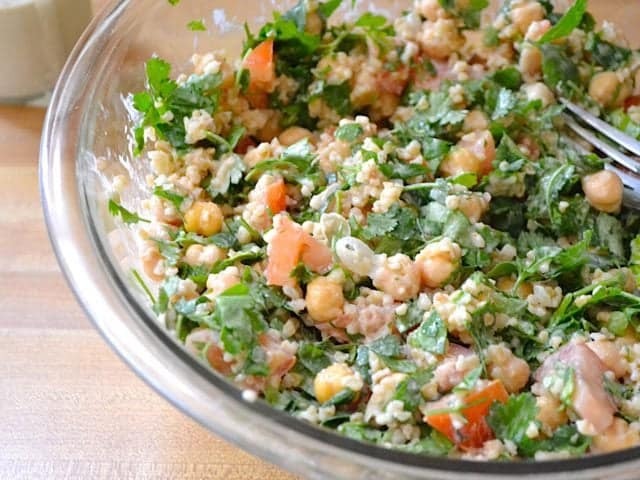 I used 1/2 cup of dry bulgur for this salad. 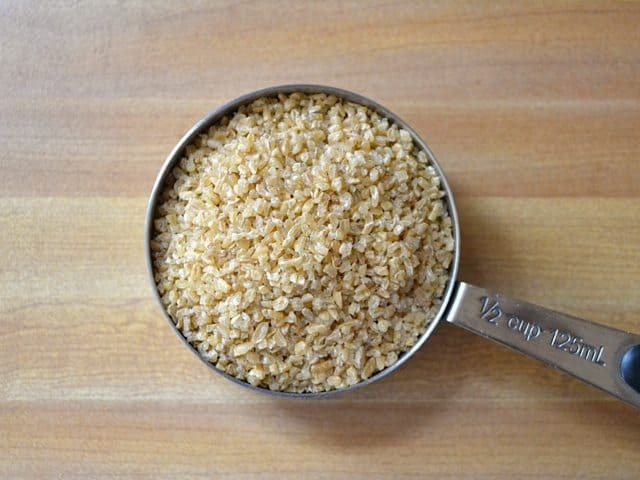 Toast the bulgur slightly before cooking it to make it a little more scrumptious. Just add it to a small sauce pot and cook and stir over medium heat for about two minutes. Because there is no moisture in the pot at this point, it will toast the grains. Finally, add a cup of water, let it come back up to a boil (which will be fast because the pot is already hot), then add a lid and turn the heat down to low. Let it simmer on low for 20 minutes. After 20 minutes, fluff the bulgur then let it sit in the fridge for about 5-10 minutes to cool. Leave the lid off while it’s in there so the excess moisture evaporates away. That way you’ll have nice little chewy bits, rather than sticky wet bits. Now on to the vegetables… Wash the one bunch of parsley and one bunch of cilantro well. Nothing ruins a salad faster than sand. Try to get as much of the water off as possible. Pull the leaves from the stems. The stems are soft and edible, too, so you don’t have to be very precise about this. Just pull what you can off. Give the leaves a rough chop. I probably should have chopped mine just a bit finer, but it’s all good. Dice two small tomatoes (yes, mine were on sale). Rinse and drain one 19oz. 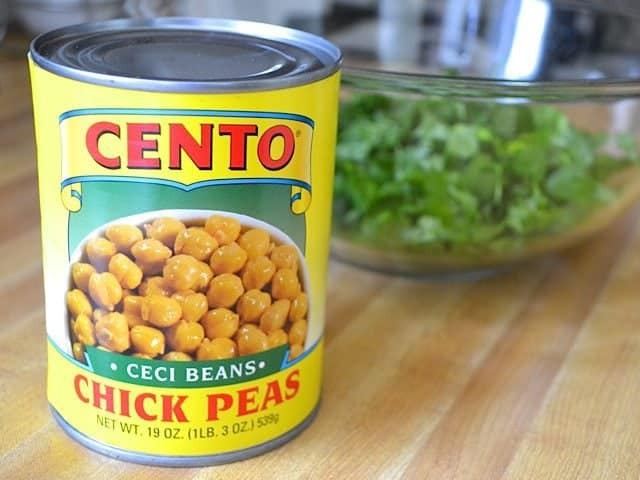 can of chickpeas. If you can’t find the 19oz. size can, you can just use a 15oz. can, or if you want extra chickpeas, go for the gold and use two 15oz. cans. 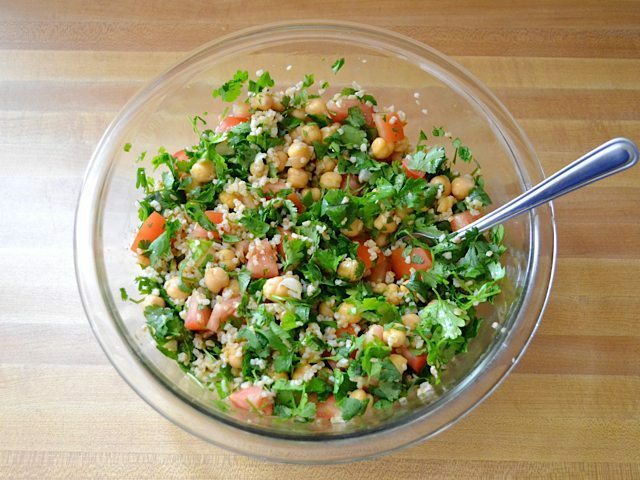 Add the cilantro, parsley, chickpeas, tomatoes, and cooled bulgur to a bowl and stir them all together. Pour it ALL over the salad. Honestly, the more dressing the better with this one. I used about half of the batch of dressing… and still kinda wanted more. And then stir it all up so that everything is drenched in that amazing dressing. NOW EAT. This made about 5 cups of Falafel Salad. Four large servings or six smaller side salad type servings. Of course, if your bunches of parsley and cilantro are different sizes than mine, you may get a different yield. Either way, I could have probably eaten at least half the batch in one sitting because it was so good. RESTRAIN YOURSELF, BETH. This is absolutely amazing! I put it in wraps and it tasted like restaurant quality! I made this with cucumber and feta and it was DELICIOUS. Made 3.5 cups. Definitely making it again! Made it! Loved it! Will make again! I made a big bowl of this today and it’s delicious! Rather than bulgur I used hemp hearts. I just dry toasted them in a pan and added them to the bowl and they worked out very well. I also added extra cilantro and parsley because I wanted my salad to be greener. Thanks for such a great recipe! I just made this for dinner, so simple and flavorful. 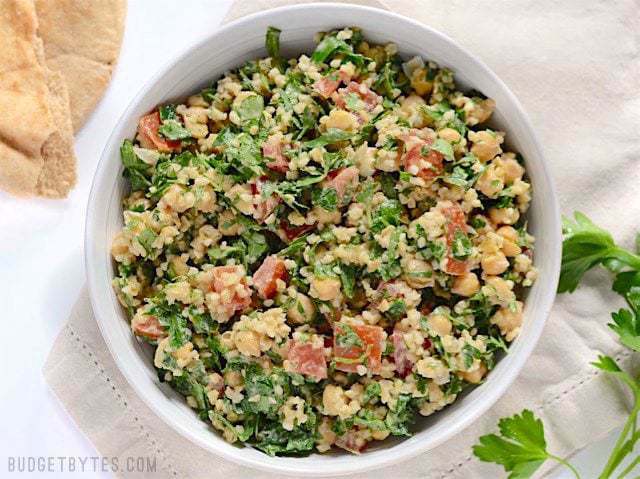 I had this in a warm pita and it was exactly what I was craving! Loved it. Made the recipe like written, perfect! Made this for dinner last night, and it was DE-licious. Kept well in the refrigerator for lunch, too! This recipe is such a great idea. We eat falafels a lot but it’s nice to mix it up. The flavor of the sauce is amazing. Though I skip the water and just add as much lemon juice as needed to make it mixable, for a little extra zing and for less watery/soggy flavor in leftovers. I add cucumber and finely diced onion as well. And we like to eat ours in a fresh baked pita pocket, usually with some cabbage tomato salad on the side (recipe I use is from “maryam’s culinary wonders” blog). I also always use “bob’s red mill” brand whole grain bulgur – it is so much more flavorful than other brands. I cook it al dente – after rinse, add only scant 1.5x water, bring to boil, then cook on very lowest setting for only 10 minutes. Anyway thank you so much for this recipe idea. It is easier and quicker than making falafels, great for a weeknight, but it’s not just easier it’s also delightful in its own way. Something about the way the dressing coats every single component. Do you think it would taste as good with the other type of parsley? Loved it with the original recipe, but have a bunch of curly leaf I need to use up. Ive made this recipe and to keep it fresh for longer I just refrained from adding the dressing and tomatoes until I was ready to eat it. Hmm, aside from making more salads, you can maybe try drizzling it over roasted vegetables after they come out of the oven. I used all of the dressing on the salad.. ( ._.) I have no regrets!